​I want to be happier than this, I want to be more patient with my lovely children. I am a good person and I love my family but more and more I am snappy, impatient and crabby with the people who I love the most. There is only one thing in this world that can make me stop talking, that can make me be quiet and pull away and that is pain. I am so tired, really really tired. 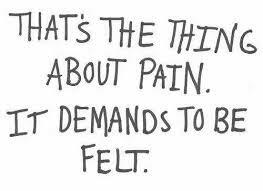 This pain is too much and I am starting to wonder if i’m a wimp, why can’t I handle this pain. I would be a different person without this pain. I would be a better wife, better mother and better friend. I don’t need to be told I’m good enough or how brave I am, I know that I am trying hard and I respect myself for that. I want to be better though. This is too hard, at times its too hard to smile and pretend I’m not feeling sick with pain, I want my life back. I am not brave, I’m a fraud, i am a master at pretending but my mask is slipping and I am tired. If I concentrate really hard i can cope but this is taking up most of my energy and leaves me less than I used to be. It makes me so angry to know I’m not entitled to help with the pain other than pills, I don’t want more pills. I want other ways to deal with this i know there is so much pain support out there and I can’t access it due to where I live. It is not fair to have to choose between being in a lot of pain or being in a lot less pain but drowsy and spaced out from painkillers. Where is my happy medium, I was told today at the doctors that in cases like mine they don’t intend for me to be pain free but for it to be ‘livable’. I will give them thier dues this is livable and there are many many people who are just living, just getting by in pain, I am not unique in any way in this. So I’m rambling again because this distracts me. I underestimated how common it is to live in pain everyday. I hope there is a solution to popping stronger and stronger pills as time goes by. This is not the future I imagined but I’m evolving and maybe I’ll petition for a change in accessibility for pain management services. At least that would be doing something positive.